Every year, thousands of avid birders flock to important birding areas in the state of Michigan, hoping to see or hear a few of the millions of birds that are migrating to their breeding grounds. Birds migrate north to their breeding grounds mid-March through May; they then migrate south to their wintering grounds mid-August through October. Unfortunately, many migratory birds will meet an untimely death by colliding with glass or manmade structures, a phenomenon known as a bird collision or bird strike. It has been estimated that up to 1 billion bird-collision deaths occur every year in the U.S., according to the American Bird Conservancy. As humans continue to build structures that contain glass, the threat of bird collisions will also continue. Birds and humans have a different visual system – we see the world differently. Glass appears invisible to birds and becomes a dangerous barrier they are unable to avoid. Oftentimes as a result, birds will fly directly into windows, causing fatal injuries. In some cases, a bird will fly away after a collision, but it will likely succumb to its injuries elsewhere. The good news is that there are many things we can do to prevent these collisions from happening. Windows with blinds on them can be made safer to birds by keeping them partially or fully closed. Moving plants away from windows without blinds can prevent birds from thinking they can land on them. Moving bird feeders to within 3 feet of windows or more than 30 feet away from windows can prevent these collisions. 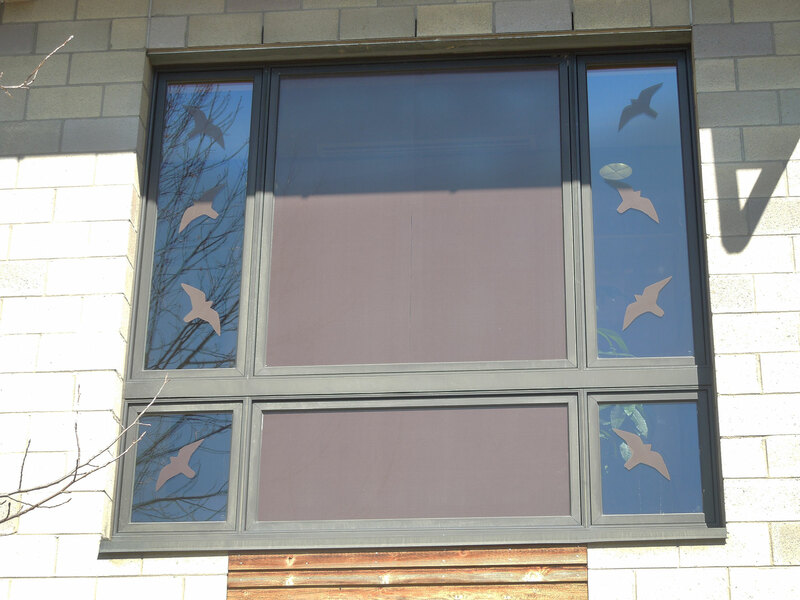 There are also a variety of window films that reduce reflection on the outside of windows: ABC BirdTape can be hung vertically – 4 inches apart, or horizontally – 2 inches apart. One of the most common preventative measures people use is decals. Decals come in many shapes and forms but the most common type used is a bird silhouette decal. Companies and homeowners can also build bird-friendly buildings by incorporating reduced visibility of glass, incorporating designs in/on glass and minimizing the use of glass. The Detroit Zoological Society believes it’s important to take care of all birds, not just those that live at the Detroit Zoo. 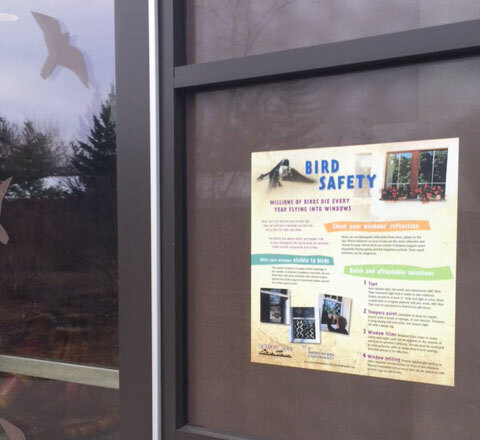 The DZS has been committed to tracking and preventing bird collisions on Zoo grounds since 2013. All newly hired employees are required to attend orientation and learn how to recognize and report bird collisions to their supervisors. Bird department personnel have used a variety of measures including ABC BirdTape, custom CollidEscape window film and bird decals to prevent collisions. The Polk Penguin Conservation Center has specially designed “fritted” glass, and we recently incorporated custom ORNILUX Bird Protection Glass into the renovated giraffe building – this glass contains a patterned UV coating, making it visible to birds but transparent to the human eye. Detroit Zoo visitors have access to educational flyers and displays about bird collisions at various locations throughout the Zoo and ABC BirdTape is available for purchase at the Zoofari Market. We encourage the community to take preventative measures to protect wild birds from colliding with windows in their homes, schools and businesses. Residents and property managers of high-rise buildings, apartments and condominiums can participate in the Detroit Audubon’s Project Safe Passage Great Lakes by turning off all building lights at night on unoccupied floors and spaces. Lights left on in buildings overnight are a major cause of nighttime collisions that kill millions of birds.